Keep track of the birds and the temperature! Four feeding ports with large perches accommodate several birds at once—even cardinals. 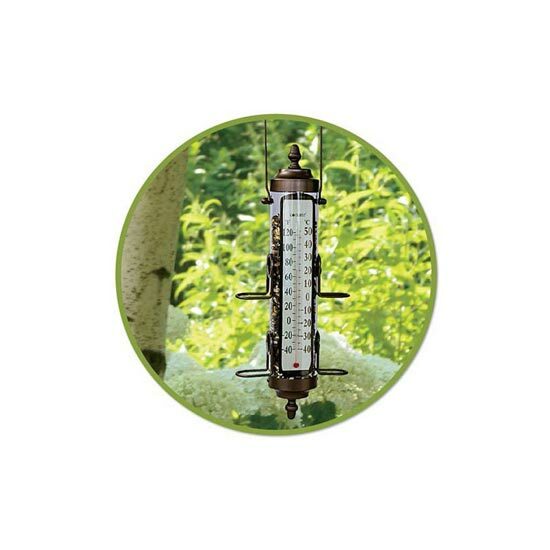 For weather buffs, the large thermometer is easy to read from a distance, with both Fahrenheit and Celsius scales. Secure-fit top makes filling easy, and the quick-release bottom makes cleaning a snap. Made of anodized aluminum with a bronze patina and UV-stabilized polycarbonate that resists yellowing. Holds 1 lb. of seed.17½ h.